Tahoe was rescued from a vet hospital where she was abandoned at the age of 18 months. She was brought into the vet for treatment after a different veterinarian removed her canines, a common practice for some owners of exotic pets. Tahoe actually had all of her front teeth removed, leaving her with only a few teeth in the back. She was underweight and had trouble eating. Because she was abandoned her fate was to be euthanized. Vicky brought her home to teach her how to eat again. For 2 months she blended up chicken and fed it to her around the clock. Tahoe graduated to bigger pieces of meat and then the bone, and after 4 months, she learned she could pick up the whole pieces of chicken with her tongue and toss them to the back of her mouth to chew. 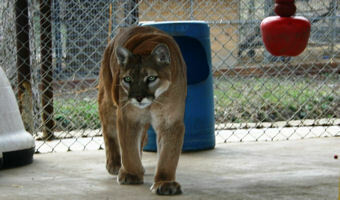 Tahoe was the first big cat Vicky rescued. She had a lot to learn about caring for a cougar. She studied books on diets and enclosures and received a lot of help from our vet and the Texas Parks and Wildlife. 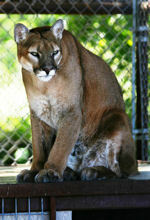 Tahoe shared an enclosure with Ranger, her long time companion, who sadly passed away April 2006. They spent 12 years lovingly doting on each other, so his absence was hard on her. She suffered from depression for several months after his death. She loved to play with her toys and snuggle with Sahara. Sadly, Tahoe passed away July 30, 2008 from complications with Lymphoma, but we take comfort in knowing she’s been reunited with her beloved Ranger. As the first cat Vicky ever rescued, Tahoe will always hold a special place in our hearts.